"The South Yorkshire Sidecar Club was formed in February 1958 by six people who met at No. 25 Stanhope Avenue, Cawthorne, South Yorkshire. As the weeks went by, more members joined up. The club then decided that it must have a name. "Happy Wanderers Combination Club" was the chosen title. At first the club met in pub rooms, but later moved to premises on Anchorage Lane, Sprotborough. Lots of long time Federation of Sidecar Clubs members know of this venue and have lots of pleasant memories of events held there. The name of the club was changed to the South Yorkshire Sidecar Club around this time. The club room was an old army searchlight battery unit barracks operated during the war. Squatters at one time lived in the hut before the SYSC members moved in. On taking over the ex-army hut the SYSC members knocked out a wall to make one big room, built extra toilets, fireplace and made room for a parking area out front, with ashes from Doncaster Power station. A high wire fence surrounded the parking area until 1970, giving security, which wasn`t really necessary at that time. By 1963, the SYSC boasted around 60 members, and held numerous outdoor and social activities. These included the rallies, which at first, were held at Doncaster, and then at Laughton en le Morthern. Price per outfit was five shillings (25 pence). This included rally fees and social evening in the Hatfield Arms. In those days the Ovaltine van would come,stay all day and sell Ovaltine and biscuits. This, as you can imagine was hugely popular. The SYSC were hosts to two Federation of Sidecar Club Rallies at Thorpe on Baine. near Askern. These were very successful. Inter club treasure hunts were run between SYSC, Lincoln and Gainsborough clubs. Average road miles were 60-80, but in 1966, restrictions on road events were introduced, so these were abandoned. In the late 70`s the club declined to about 8 members, and then for some strange reason began to grow again. It was about this time that my great friend Alf Tindall and I joined the SYSC. Not that this had any great bearing on the re-growth! That was down to a committee change of policy,which was Get out and recruit new members, don`t wait for them to come to you. To this end the SYSC put on displays at the Classic Bike Show at Belle Vue. These where were held until the Show moved to Stafford where it became a Federation of Sidecar Clubs event. The SYSC also put on displays at most of the local transport extravaganzas. These events really helped the club membership figures. The SYSC 25th Anniversary party was held on 7th May 1983, When past members were invited. This was a huge success, 83 people filled the clubroom. Some ex-members had not seen each other for years. It was wonderful to be a part of it. The Anniversary party is now held every 5 years, and is still as popular. This year is the Golden Jubilee year. The end of the 80`s brought with it the end of an era. We got notice to quit the clubroom, this was on the pretext that only 2 club members lived in Sprotborough. I personally think that the peppercorn rent that we were paying (£12.50 per year) just wasn't in line with Thatcher's Britain. So it came to pass, that on Saturday 17th September 1988, the club held a grand jumble sale. Talk about everything must go! All the club's assets were up for sale, kitchen equipment, cooker, crockery etc., snooker table, piano, tables and chairs, sofas sideboards, carpets, the lot. At the end of the day, the clubroom was just a shell. A very sad day. Once again the SYSC fortunes took a downward turn. Club membership fell to an all time low of just 5 members. But, yet again, after drifting from place to place, the SYSC is now settled at Moorhouse Equestrian centre, at Hampole, near Doncaster. Club membership is now well over the 50 mark. We must be doing something right. Also 50 years old, is the national club, The Federation of Sidecar Clubs. 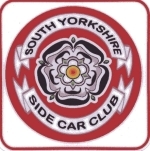 The South Yorkshire Sidecar Club is an original member of the Federation of Sidecar Clubs and is the oldest sidecar club in existence. The SYSC recently held the Easter Egg Rally at Silverwood Scout camp, near Barnsley. We put on various activities to celebrate the fact that the club is 50 years old this year. Despite the horrid weather that was around at this early Easter time, a near record number of sidecarists booked in to the event. Our thanks to them all. To cap this all off. On 10th May 2008, we had the 50 year re-union. This event was even more successful than the 25th anniversary. Over 150 people turned up to celebrate the occasion, and the car park was crammed with combinations of every description. Once again, members old and new joined together in friendly banter. As a footnote to this saga, we at the SYSC were given notice to quit the clubroom at the equestrian centre after 18 happy years. Our new home is at the HQ of the 9th Scout group of Scawsby, Doncaster, situated near the rear of the Sun Inn at the junction of the A638 & A635.